Pupils at Charlotte House have once again achieved fantastic secondary transfer results with every girl achieving their first choice of independent secondary schools. 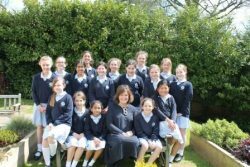 The small classes make it possible to offer a bespoke preparation programme which starts in Form IV; by the time the girls are sitting crucial exams they feel fully prepared for everything the transfer procedure has in store. Every year a huge variety of national and local schools both state and private are applied to and we are immensely proud of all our girls who achieve places at prestigious schools including Watford Girls, Haberdashers’ Aske’s and Rodean.